I have corrected the Fr-text, avij, can you "push on the button", please ? There are still quotation marks in the translation of M_SERIALNUMBER_HELP. OK, corrected, and also for M_PRINTERCODE_HELP. So OK : that works fine, thanks a lot ! : Bill was not entered. You have already entered this note on 2014-11-23 12:34:10. You are probably making a mistake. : Biljet is niet ingevoerd! Je hebt dit biljet al ingegeven op 2014-11-23 12:34:10. Waarschijnlijk maak je een vergissing. : Billet non enregistré. Vous avez déjà entré ce billet le 2014-10-13 22:24:02. Vous faites probablement une erreur. (***) Choose after clicking the good language and it will appears normally. I think the "é" into the word "série" is the origin of this mismatching, but I don't know how to correct it - and if I can make the corrections via EBT Babel Tool. GREAT : it works now ! a) according to the "EUROPA" series, is it possible to definitively fix the - flag and not the - flag, into each type of encoding's filling forms (Simple - Advanced - Expert), for E***** (short code for Oberthur) / EA*** or EB*** -serial numbers ? b) for each "Support request" of "Hit's De-Moderation" linked to a note from "EUROPA" series ( AND ) - like this, is it possible to place the good flag for the printer, and not the - flag ? c) only into the "Advanced" encoding's filling form, it is possible to activate the button "TRANSFER to above form" ? This button works good onto the "Expert" encoding's filling form. Thanks in advance for fixing these ! LArdennais wrote: c) only into the "Advanced" encoding's filling form, it is possible to activate the button "TRANSFER to above form" ? This button works good onto the "Expert" encoding's filling form. error message is : TypeError: document.notes.elements[((startIndex + (elementsPerRow * i)) + 3)] is undefined in insertbill.js line 111 (from firefox console); seems linked to old code running with new form design. For those who want to help with site programming, please contact dserrano5, the leader of the Development Working Group. He will be happy to provide you all the details you need about site development and how to join the WG. NB : for the "current month" and the "last 7 days-period" pages, it seems normal...enfin, I hope ! 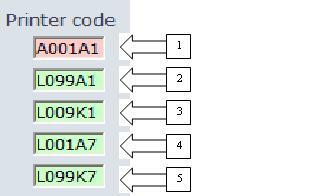 (5) And for a printer code with all the last three error's characteristics (i.e. L099K7, the inputting box is colored in green ! There was a single hit which had a "last hit date" of 0000-00-00 00:00:00 for some reason. This caused some problems. Actually, I won't mind if this won't be fixed. The reason is that sometimes I know the serial number, but not the shortcode. In those cases, I enter the note with a non-existing short code (like Z004X9). This way it's easier to recognize the notes I need to figure out what the short code is (by searching in my own list of notes or asking at the forum or chat to other EBT-ers). In this case I know the first part (Z004) is correct, I only have to search for the last 2 figures (X9). If I have to use an existing short code, I wouldn't recognize this note as "note to search short code for", so it will be entered with a (most likely) wrong short code (what also is an item to recognize fakers). Case a. must be extremely rare. In 20 thousand notes that has never happened to me. Both cases a. and b. are easily dealt within the comments, no need to create a non existent printer code (even if you need to write a fictitious printer code, it doesn't have to be noon existent). Case c. is, if I'm not mistaken, against EBT's rules or recommendations, and rightly so (notes should be or have been in your "hands"). Arguably, case b. falls under this category too. My own take on this is that you may register a note of and only if you've seen both printer code and serial number (or could have seen them, as when you don't have your glasses on and your friend reads them out loud to you). I think It will be great if you could improve the automatic moderation to stop mixed bundles. One hit a day with the same user is "interessant". More should be moderated. If those ones, which mix bundles, start to enter a bundle on several days/locations, you may take action easier. Why? Because mixed bundles are faking statistics. It´s obvious if you check Belgium´s stats. It´s the only country that get more hits with less notes and less users. (about 850 actives users in 2011, nowadays 550-560). A lot of belgian users mix bundles.